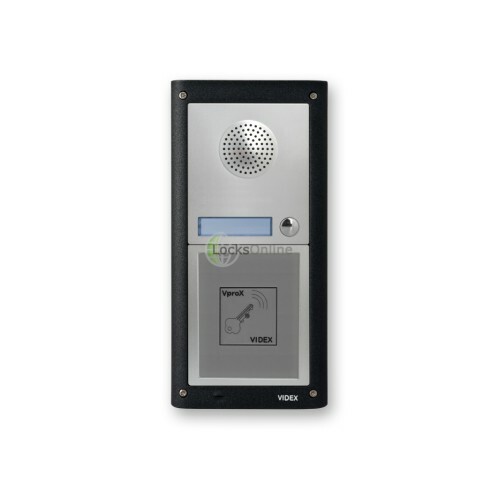 Offering key-card and fob access for occupants as well as up to 2 call-buttons for visitors to call individual residents, this professional Videx door entry system provides the traditional means of allowing you to let visitors in via a button on the handset when receiving a call from the front door station, whilst also offering keyless entry by card or fob for authorised people with a registered key-card or fob. Often installed in both residential and commercial settings, these professional Videx systems are widely considered by many installers to be one of the most robust solutions for commercial use where build quality and performance are considered highly important. 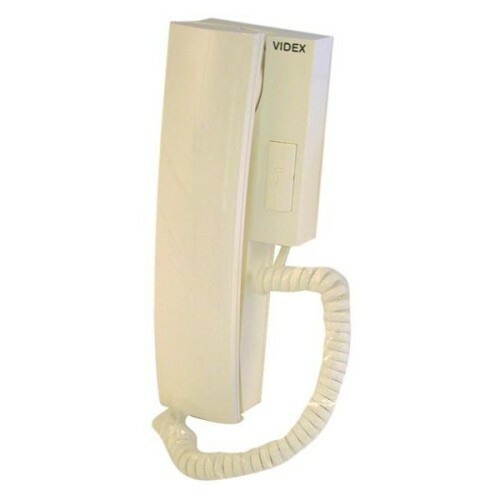 The Videx range offers the level of quality that you would expect for use in these types of environments. To compliment this, these systems also allow for use of up to three handsets per call button, allowing you to situate multiple handsets where you need them. 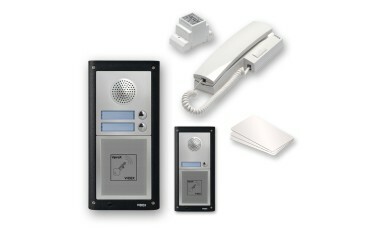 With these intercom systems, when a visitor wants to gain entry to the property they must press one of the call-buttons on the speaker unit to call through to an internal handset, from which an occupant can either grant access by pressing the unlock button on the handset base, or of course deny them access by simply hanging up the call. Residents can then take advantage of full keyless entry into the property using the professional VproX proximity reader built into the housing below the speaker unit and call buttons. Simply by presenting your key-card or fob to the reader built into the intercom station, the system will read your card or fob to check that it is valid and registered into the system, and will then grant or deny access accordingly. Upon successful validation of the card or fob, the internal relay (NO / NC / COM terminals) will change state to operate the lock or electric release that has been wired up to it, allowing entry into the building. However if an invalid card is presented, the system will refuse access and maintain the relay status, therefore not unlocking or releasing the door. 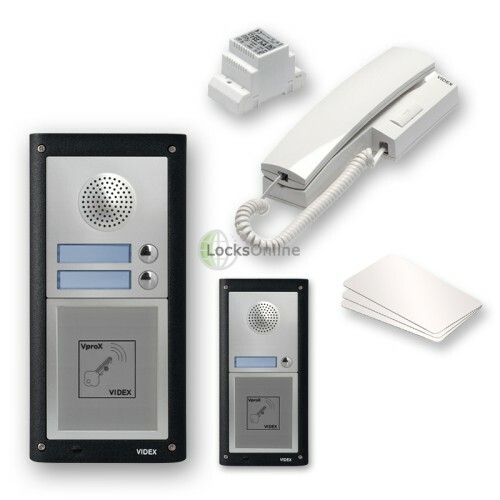 As standard, the kit comes with 3 key-cards to get you started - however you can also purchase more Videx cards or the alternative key-fobs to suit these systems, up to a maximum of 100 total users. 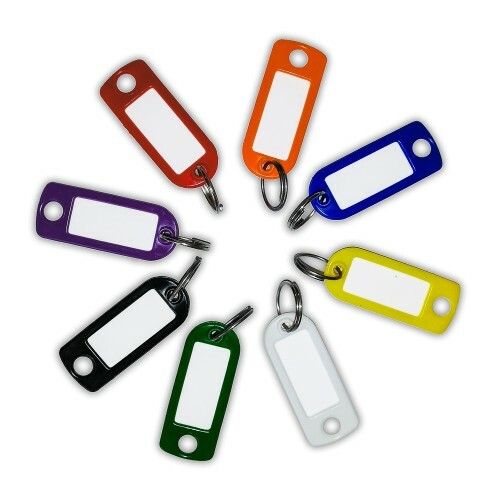 You can then record these users on the user key-card record sheet available in the product manual to keep a record of who has which card or fob number, so that if you later need to delete that token off the system due to the card being lost or stolen, you can do so without having the card present, by keying in the number of the card or fob into the system via the internal buttons following the deletion process detailed in the programming instructions. These systems come with a 1.3Amp power supply (@12v AC) as standard, providing enough power for the system and normally for an electric release or similar too, as these systems will only require approximately 250mA when inactive, and up to around 300mA when active. 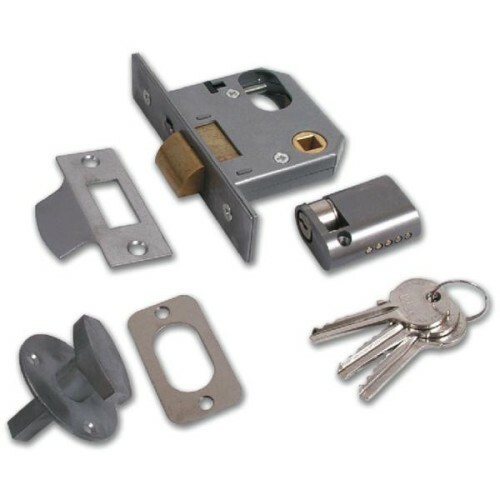 So there's usually plenty of scope there for basic locking devices - but if not, you can use the dry set of relay contacts inside the unit to trigger your lock with a totally separate power supply being used. With these kits the overall size is 280mm (approx) in height and just under 135mm wide- this comprises of the speaker panel situated at the top, which also accommodates the single or double set of buttons, and then the proximity module. Please bear in mind when considering these for your project, that these are a specialist item and as such any items not showing a specific stock quantity must be ordered on special-order and may take some extra time to arrive with us before we can ship it to you.